running Archives - Page 17 of 17 - RunStuRun :. So yesterday went relatively well. Luke and I got started around 4:30 from the 7-mile mark of the Cirque de Boulder route. Let’s call it the semi-cirque. We started off under overcast skies and moderate temperatures. Pretty near perfect conditions. The first half of the route went smoothly and Nichole and Pete met us at Gregory Canyon to help crew. Special thanks to those two as we were both out of water by this point and it is always good to see a familiar face. We jammed up to the Mesa Trail and this is when my right ankle started acting up. No biggie, just kept running and ignored it. We were treated to some amazing views with the sunset highlighting the Flatirons. Really just a gorgeous evening. We dropped down Blue Stem around dusk and pushed the pace along 93 and got to the Bobolink trailhead (I think) just as darkness started to set in. There was a pack of howling coyotes in the meadow through which we ran just yipping up a storm. Really cool to see this much of the Boulder Valley and Foothills in Springtime. The wildflowers and dogwoods were blooming, the pines were sprouting fresh needles and everything is getting green again. We ran through the darkness under an amazing new moon to Luke’s parents’ house and grabbed a ride back to our starting point to retrieve my car. All in all a good run. I am a bit hammered today. I felt like I was hungover this morning. I don’t think I rehydrated enough post run and definitely didn’t eat enough after we stopped running. My left knee swelled up quite a bit where I banged it last week but I think this, along with the ankle issue, will resolve itself in due time. I plan to limit my activity to hiking and biking for the next few days. All told, we logged at least 23 miles in about 4.5 hours. A bit off our intended pace but a pretty decent effort nonetheless. Today, I drove to Gunnison to hang out with my parents. I head back to the Front Range tomorrow and will probably take it a bit easy thru the weekend. I’ll keep you posted. Recently, Rage made the observation that the pile of shoes in our mud room consisted of mostly size 10s. I must confess, the volume of footwear I possess is a bit ridiculous. It seems that every activity in which I participate leads to a new shoe purchase. Plus, I am currently rotating 3 pair of running shoes, etc., etc., etc.. It is a bit obscene. So I looked into recycling programs for shoes to see what one can do to help get shoes that are worn but not worn out into the right hands. Good stuff. Yesterday, Rage and I went for a hike in Golden Gate Canyon State Park. This great little front-range treat is just up the hill from our house and features some killer hiking and biking trails. I plan to spend a lot of time there this summer. Today, I plan to go for a run after work up near my house. I want to see if the trails in Roosevelt National Forest are clear. I’ll keep you posted. Edit: No running tonight. I am feeling a bit like a wuss and it was hailing during the period I was planning to head out. I am trying to rally the troops for a Singlespeed ride tomorrow after work. Anyone who is interested, let me know. In order to avoid scaring any readers off with continued tales of woe (our beloved kitty, Samantha died yesterday), I will post a few things I learned during yesterday’s productive, 4+ hour altitude run. The route I took started from my house and ran down the Beav to Coal Creek Canyon. I then headed east to 97 and up to Magnolia. East briefly on Mag to the Blue Dot trail head tail and backwards on the Dots to Ned. Ned to the High School trails, West Mag and a sneaky trail back to Rollinsville. From there, I pretty much bee-lined it back home. I spun my last mile in about 7 minutes. At least I had that to brighten my spirits. Not sure how far I ran in total but I was pleased with the effort. Jackets with hoods are necessary. In the ever-changing weather of the Rockies in the Springtime, one needs proper protection. My hooded jacket, unfortunately, is still on its way. I should be able to test-drive it later this week. Drinking is a good thing. No, I don’t mean lugging around bottles of fortified wine, but I do recommend creating a system that works for you to stay hydrated. Yesterday, like most, I ran with my trusty Shuffle, and made sure to drink at the end of each song (at least). This seemed to keep me very well hydrated throughout the run. Good stuff. I also experimented with soda and protein drinks. Both of which seemed to do the trick. There’s no school like the old-school. I dipped into the bag of old tricks and went for the old-school solution of PB&Js for my main “meal”. Seemed to work well. I think this is a combination of my getting better used to eating on the go but regardless, I plan to add the old standard to my new regimen. Eat, drink, eat, drink, repeat. I try to start eating no more than 20 minutes into my longer runs. This helps to get me in the habit of ingesting calories throughout my effort and starts replenishing energy reserves immediately. This also helps me to graze vs. trying to choke down a huge meal all at once. Thanks to Luke for the killer Gorp recipe: Almonds, Pecans, Chocolate-covered Espresso Beans, Dried Cranberries, Sunflower Seeds. Good stuff. Other than those items, I can report that Blue Dot is almost completely clear as are the Highschool and West Mag trails. Gentlemen, start your bikes. I am not sure what the plan for Monday entails. Probably a run but we’ll see. Seems that gravity is more than just a theory, my friends. Yesterday witnessed two casualties of Newton’s First Law: Brad decided it would be a good idea to test the tensile strength of a street sign, and I introduced my mouth to a very large rock. The rock, as you can imagine, won. Our Singlespeed ride was a blast. I may have to outfit my ride with a fork, however, as I quickly remembered why full-rigid went the way of the dodo bird. How did we ever ride this way? Still, a good time was had by all and Brad and Luke kept the fun and/or games in full effect. We headed out from Brad’s house (post road sign encounter) and jammed up to Betasso for a quick lap. Then it was back to town to toss on the running duds for a run with Jess up Sanitas. Up was a steady slog, as usual. On the descent, the excitement began. Essentially, I blew a step, tripped and decided somewhere along my fast arc to the ground that it would be best to lead with my face. Fortunately, my teeth are all intact and my jaw only feels slightly like I took a pummeling from Mike Tyson. Or Cicely Tyson at least. 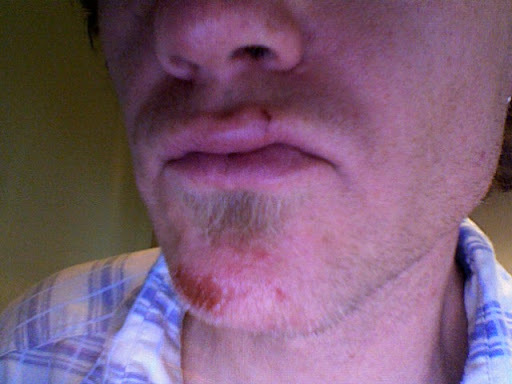 Overall, the damage wasn’t too bad: a scraped and banged knee, hip, wrist and chin and a small cut on my lip. If you want to bake a cake, you have to break a few eggs. Unless you don’t eat eggs in which case you can use Egg Replacer and my analogy gets all shot to hell. Today, I may go for a short ride run at lunch and maybe a hike after work but will chalk today up as a rest/recovery day. Luke and I were going to try a modified Cirque de Boulder tomorrow but I think that will be postponed for the time-being. I’ll keep you posted.